You know that you want to sell your home. You also know that getting your listing out wherever people can see it can help you sell for the best price, right? Wrong! 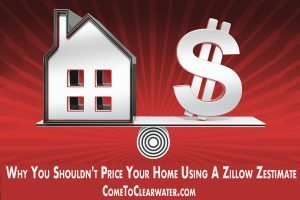 Many sites are way off and one, Zillow.com, has a tool called a “Zestimate” which is supposed to give you an estimate of your home’s value. Problem is, it is very inaccurate, and it will make your home look overpriced. Yes, the fact is that in most of these cases, the Zestimate appears to be considerably lower than the asking price. Zillow claims that when they come up with their Zestimate, they use specific types of information and an “advanced algorithm” to come up with a figure. The problem comes in with where they actually get the information. For instance, some states don’t publish any information about real estate transfers, including sales price. The physical attributes are put in by the seller, not a real estate professional. When buyers see that inaccurate Zestimate, they think that it’s the actual value and that you are overpricing your home. It makes for bad negotiating. Your best bet is to trust your Realtor to truthfully and expertly evaluate and value your home. Then let your Realtor choose the sites that have your listing.